Compatible with Apple iPhone 7 Plus(5.5 Inch). Shockproof TPU bumper offers 360 degrees protection while keeping it stylish and functional. Raised bezels to protect camera and screen. Built-in metal plate for magnetic car phone mount. Anti-scratch resistant and Anti-slip grip prevents your phone from slipping out of your hand. 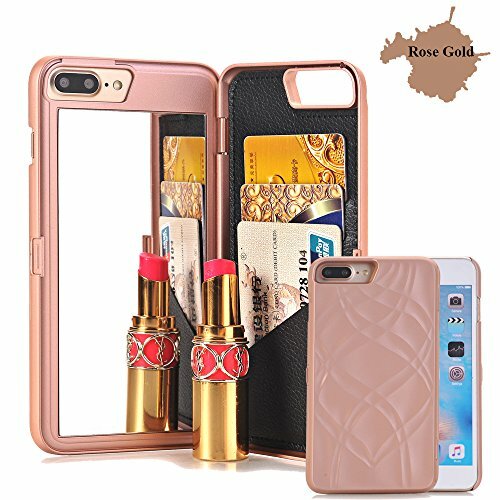 ✔ JOGUO iPhone 7 Plus cellphone cases perfectly fits your phone with precision cut outs for all buttons and ports.✔ Shockproof TPU bumper offers 360 degrees protection while keeping it stylish and functional. 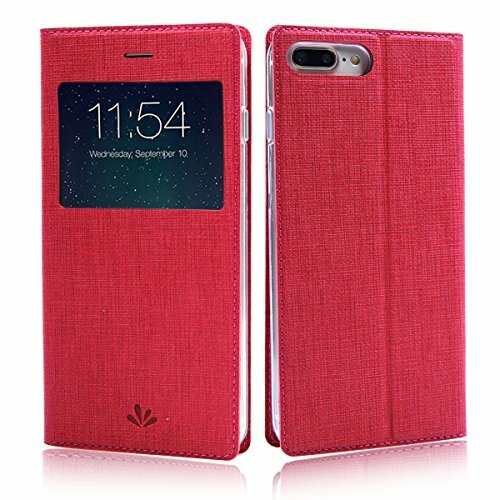 ✔ Premium faux leather coated back and sides provide a perfect grip feeling, soft and skin friendly, Anti-scratch resistant and Anti-slip prevents your phone from slipping out of your hand. ✔0.3MM higher raised bezels than the camera and screen, to avoid scratching or touching any flat surface.✔Built-in metal plate for any magnetic car phone mount which is our unique design, so there is no need to have any extra metal tag to stick on your phone. 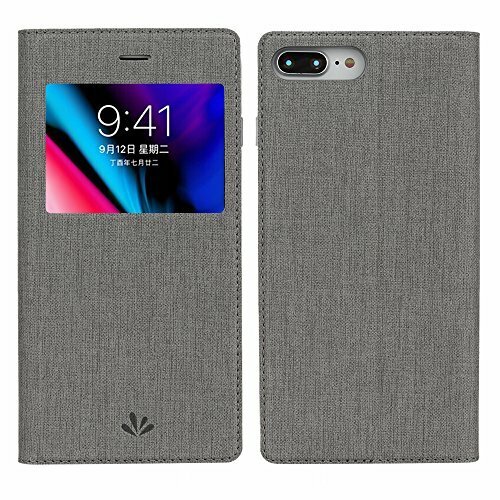 JOGUO business series premium faux leather coated soft TPU cases have 6 months warranty , any inquiries please contact us via email and we will reply within 24 hrs. Package Including: ◆JOGUO business series case*1 pc ◆Clear tempered glass screen protector*1pc◆Screen protector toolkit*1 pack . 3.Unique Creative Design, with a soft sensitive silicon slide bars to answer the phone without opening the case and soft silicon well protected your phone glass screen not to scratch comparing with the metal strip bar, the smart silicon slide buttons are ingenious sensitive enough to answer/decline the phone even with tempered glass screen placed. 4.Perfect cut outs for the speaker phone and microphone, built in stepless stand while folding into a kickstand position to watch videos hands free, magnetic closure to auto lock the case, also the front cover can magnetize to the back cover when completely flipped open. 5.View Window for Multi-information: Signal, Battery Status, Messages, Missed Calls, Time/Date, Current Music Details (if using Music Player), etc.Built-in Stand Function: Plus an Insert Kickstand for Adjustable View Watching. 1. Compatible with iphone 7 plus and iPhone 8 plus 2017 model. 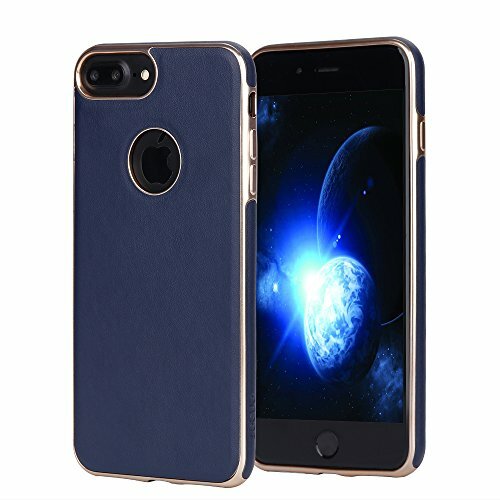 Made with premium PU outside, snap-on cradle is created with a highly soft and clear color matched PC, it will not scratch your iphone shell; hard coated plastic screen in the front viewing window, better anti-scratch protective function; 2. The case surrounds all the edges, cover the whole phone with a full body protection on front and back when phone in your pocket and purse, well protected, more safe including the volume buttons and the mute switch, not just a bumper guard for the sides or back, really 360 protection. 3.Unique Creative Design, with a soft sensitive silicon slide bars to answer the phone without opening the case and soft silicon well protected your phone glass screen not to scratch comparing with the metal strip bar, the smart silicon slide buttons are ingenious sensitive enough to answer/decline the phone even with tempered glass screen placed. 4.Perfect cut outs for the speaker phone and microphone, built in stepless stand while folding into a kickstand position to watch videos hands free, magnetic closure to auto lock the case, also the front cover can magnetize to the back cover when completely flipped open. 5.View Window for Multi-information: Signal, Battery Status, Messages, Missed Calls, Time/Date, Current Music Details (if using Music Player), etc.Built-in Stand Function: Plus an Insert Kickstand for Adjustable View Watching. 2. 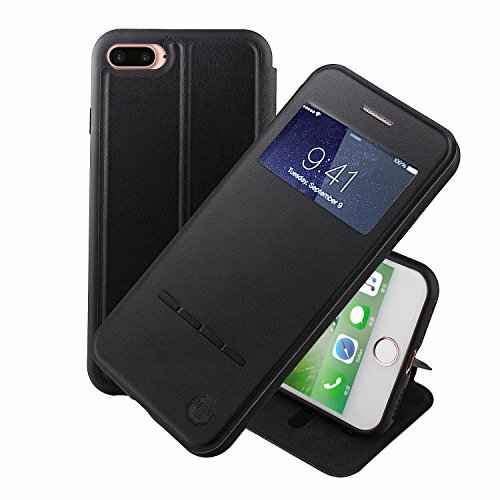 The iPhone 7 Plus iPhone 8 Plus Smart Flip Case surrounds all the edges, cover the whole phone with a full body protection on front and back when phone in your pocket and purse, well protected, more safe including the volume buttons and the mute switch, even Apple Logo, not just a bumper guard for the sides or back, really 360 protection. 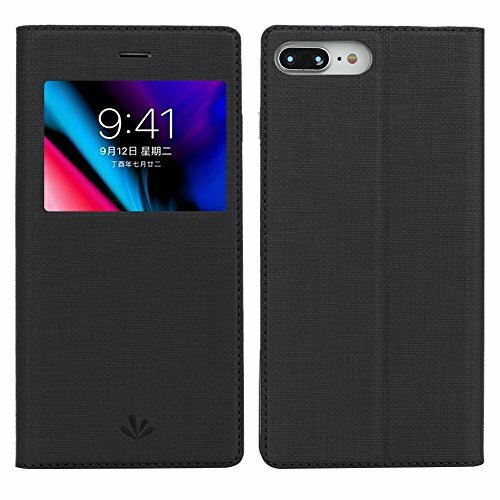 3.Unique Creative Design of iPhone 7 Plus iPhone 8 Plus Smart Sensor Touch Case, with a soft sensitive silicon slide bars to answer the phone without opening the case and soft silicon well protected your iphone glass screen not to scratch comparing with the metal strip bar, the smart silicon slide buttons are ingenious sensitive enough to answer/decline the phone even with tempered glass screen placed. 4.Perfect cut outs for the speaker phone and microphone, built in stepless stand while folding into a kickstand position to watch videos hands free, embedded magnetic clasp secure lock the case, also the front cover can magnetize to the back cover when completely flipped open. 5.Viewing window, able to see some information like incoming calls, messages, time without case open. 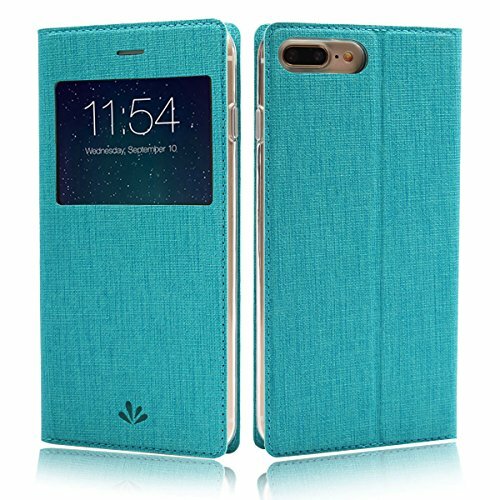 Your iPhone will fall in love with this ultra slim thin lightweight professional protective functional user friendly iPhone 7 Plus iPhone 8 Plus case. Auto Sleep Function is not available on this case due to iPhone don't build in like iPad. 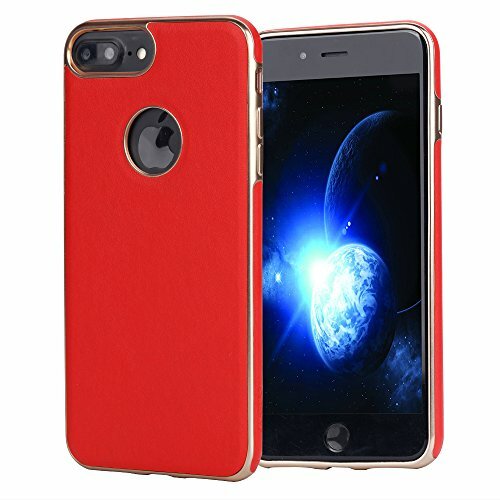 Product Quality And Supplier CredibilityNouske iPhone 7 Plus iPhone 8 Plus Smart Touch View Window Flip Case Cover, compatible with iPhone 7 Plus(2016 release) and iPhone 8 Plus(2017 release)which with 5.5" Rethina HD display, designed and Manufactured by Nouske only, a professional manufacturer of cell phone case and tablet case and ebook case since 2008. Please be noted this case doesn't support auto sleep and wake up function due to iphone have not built in this function like iPad do. The iPhone system default value is one minute. Or you can press power button to turn off screen backlight for power save.Please choose the right size for your smart phone, it is a case for iPhone 7 Plus and iPhone 8 Plus, not compatible with iPhone 7 and iPhone 8 . Money Back GuaranteeAs part of our strong believe and confidence in our product, we offer 90 days money back guarantee in the process you are not satisfy with it.About us:This product is sold exclusively by NOUSKETECH. Only buy from NOUSKETECH to get genuine Nouske products with Lifetime warranty and superb customer service. Nouske is a registered trademark of NOUSKETECH and is exclusively distributed by NOUSKETECH on Amazon. Compatible Mode: ONLY For iphone 7 plus 5.5 inch(2016)/iphone 8 plus 5.5 inch(2017).Gift box packing with FREE SCREEN PROTECTOR as gift. THREE separate Pu leather card slots: for carrying your most important cards, allowing you to go wallet-less when necessary or convenient. Gift Box Package Included: 1* Iphone 7 plus/iphone 8 plus mirror case 1* Iphone 7 Plus/iphone 8 plus screen protector Product Features: 1.Cosmetic Mirror inside Design : speciallly for girl, you can make up on various occasions, applying lipstick, combing hair and dressing yourself, just to keep the best condition.you could make up anytime and anywhere. 2.Card Holster : THREE separate card slots for you to carry your important cards &cash3.Kickstand function: is convenient for movie-watching ,video-chatting or browse the Web, and let you enjoy life's pleasure anytime and anywhere.Warming TipsThe mirror case is made of durable hard Pc, therefore it will be a little tight to take off the case.Kindly refer to the picture 5 there is a easily way to take it off.If you still didn't know how to take off,kindly feel free to contact us and we will give you the best solution.PaILeDou provides 100% satisfaction product to our customers, provides money back guarantee. If there is any issue with the product, please feel free to email us. We take full ownership and responsibility for the quality of our products and will do our very best to solve your problem quickly and efficiently! 1. Compatible with iphone 7 plus. 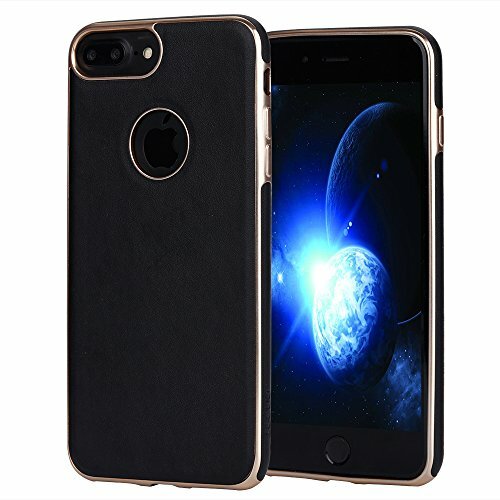 Made with premium PU outside, snap-on cradle is created with a highly soft and clear color matched PC, it will not scratch your iphone shell; hard coated plastic screen in the front viewing window, better anti-scratch protective function; 2. The case surrounds all the edges, cover the whole phone with a full body protection on front and back when phone in your pocket and purse, well protected, more safe including the volume buttons and the mute switch, not just a bumper guard for the sides or back, really 360 protection. 3.Unique Creative Design, with a soft sensitive silicon slide bars to answer the phone without opening the case and soft silicon well protected your phone glass screen not to scratch comparing with the metal strip bar, the smart silicon slide buttons are ingenious sensitive enough to answer/decline the phone even with tempered glass screen placed. 4.Perfect cut outs for the speaker phone and microphone, built in stepless stand while folding into a kickstand position to watch videos hands free, magnetic closure to auto lock the case, also the front cover can magnetize to the back cover when completely flipped open. 5.View Window for Multi-information: Signal, Battery Status, Messages, Missed Calls, Time/Date, Current Music Details (if using Music Player), etc.Built-in Stand Function: Plus an Insert Kickstand for Adjustable View Watching. The Simons of London classic handmade leather case stylishly protects and shows off your amazing iPhone 8 Plus and iPhone 7 Plus. You can get a FREE Tempered Glass iPro-tx screen protector if you click on the Special Offer below and order it with your case. Tight and secure fit - with easily accessible display, buttons, cameras and ports. Perfect protection for your awesome Apple iPhone, sleek design with hard shell, ultra slim and light weight. Convenient card storage allows for credit/ID cards to be carried along with your iPhone. A must for people on the go! Includes elegant presentation box and pouch, the perfect gift for yourself or a friend. 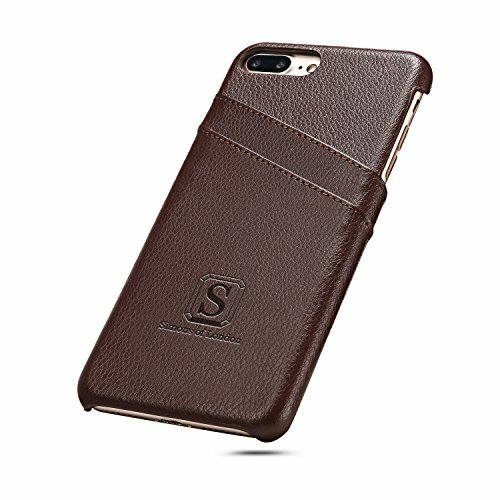 The best leather iPhone 8 Plus/iPhone 7 Plus back cover to protect your investment • Perfectly fits every iPhone 8 Plus and7 Plus • Full access to all ports including mic, camera, etc • Great stylish protection for your investment • Classic handmade leather design Want to protect your iPhone without it looking and feeling like a brick? • Vintage style case designed with you in mind • 2 slim pockets for your credit and ID cards • Lined with beautifully soft and fine suede to protect your iPhone from scratches • Delivered in presentation packaging including elegant pouch and gift box, the perfect gift for yourself or a friend. This handmade vintage style case has been specifically designed with you in mind. With two slim pockets for your credit and ID cards, it is the only case you will ever need. Lined with beautifully soft and fine suede to protect your iPhone from scratches. No risk! 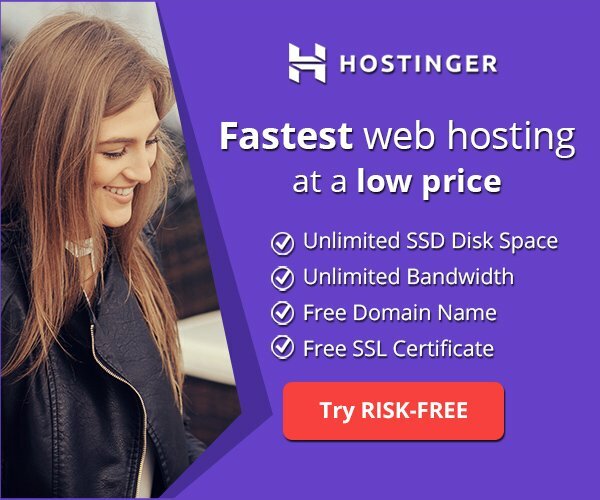 100% money back guarantee - you have nothing to lose! Scroll back to the top and Click the Add to Cart button NOW to get this unique product whilst the sale is on!